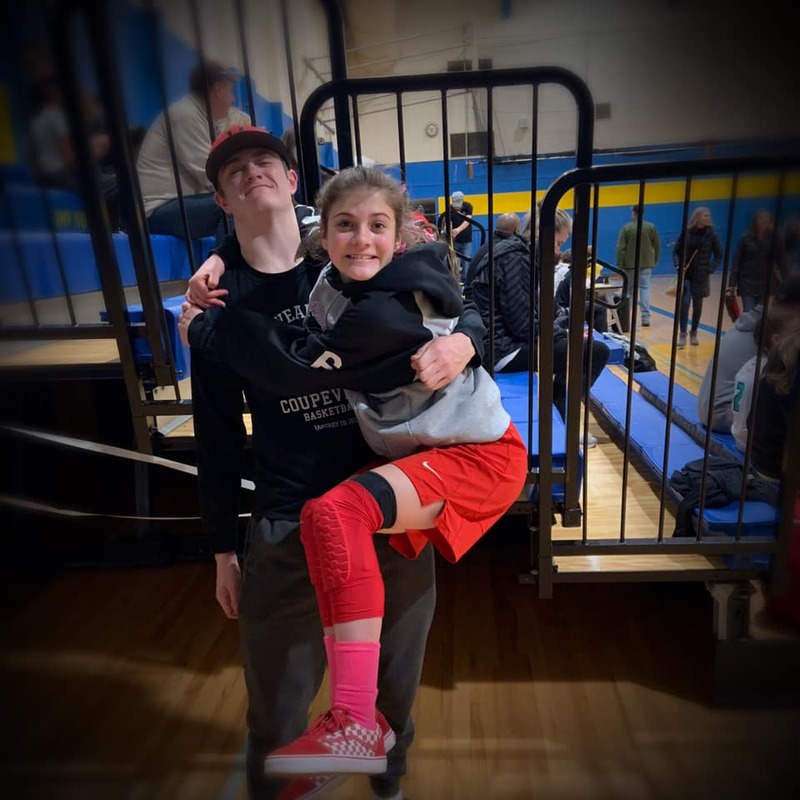 So, there’s two ways to look at what went down Thursday in the Coupeville Middle School gym. In one scenario, we spend a lot of time chastising King’s for being, well, King’s. A school which claimed it couldn’t field an 8th grade team this season, likely because a number of its players chose AAU or travel ball over school hoops, deliberately dodged Coupeville’s most-seasoned team. 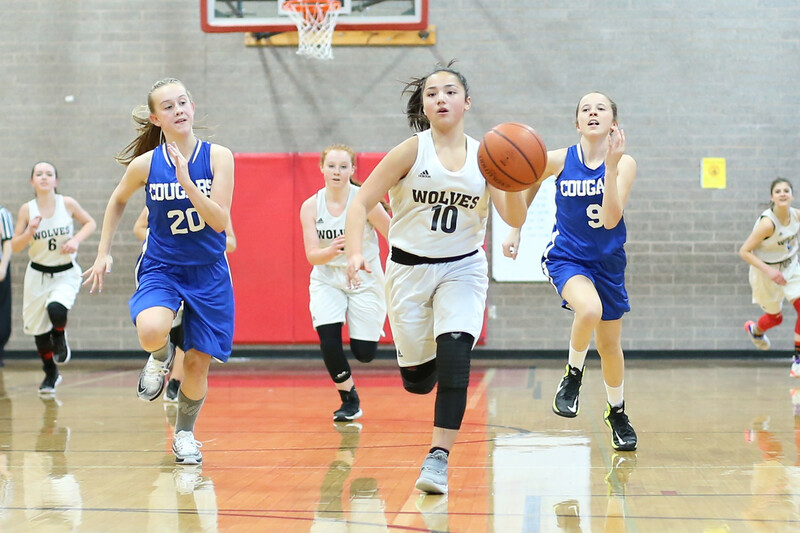 So, while the Wolf 8th grade varsity sat idle, King’s sent one squad against the Wolf 7th graders, and then sent “the rest of its players” out to smack around Coupeville’s JV. The Knights coach claimed her second team had few players with previous playing experience. While there might not have been any AAU-seasoned supernovas present, a surprising number of King’s “second squad” (we’ll say 97.9%) proved able to dribble with both hands, set screens, thread passes between defenders, and demonstrate polished shooting techniques. All things most of Coupeville’s JV team, which features only one player with SWISH experience, is still trying to master. So, rah-rah, King’s, take your 46-4 win in which you were still flinging up three-balls and aggressively going for steals in the final minute, and put it in your trophy case. And next time, step up and play the team you should have been playing, the Wolf varsity squad that was eyeballing you from the stands. Of course that won’t happen this season, as King’s refusal to play a real 8th grade schedule means the league’s planning went out the door in the week leading up to the season. With a new master schedule in place, the Wolves and Knights only face once now, and not twice, and frankly, everyone is the better for it. Coupeville’s 8th grade varsity, denied the chance to challenge private school power King’s, will instead play two games against Sultan, Granite Falls, and Lakewood, and three against South Whidbey. All public schools willing to play straight-up and not hide behind fibs and roster shuffling. 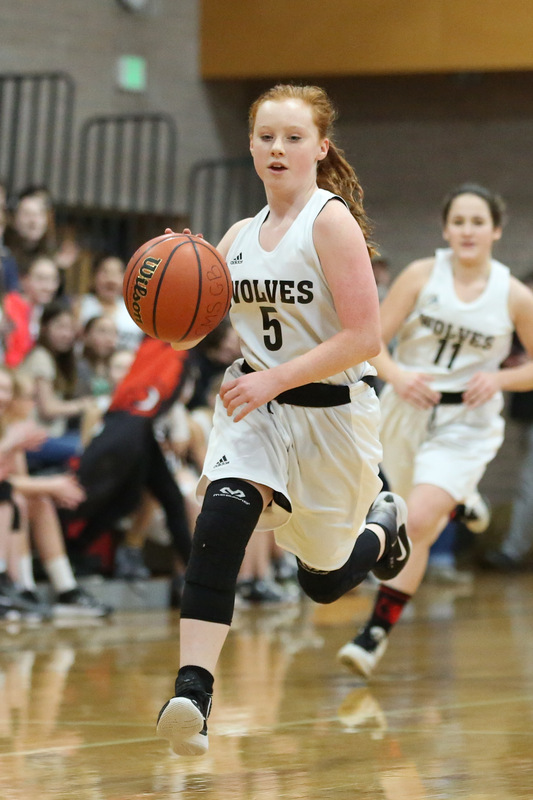 Give credit to the Wolves JV, which played hard, to a woman, all the way, even while being wildly over-matched. 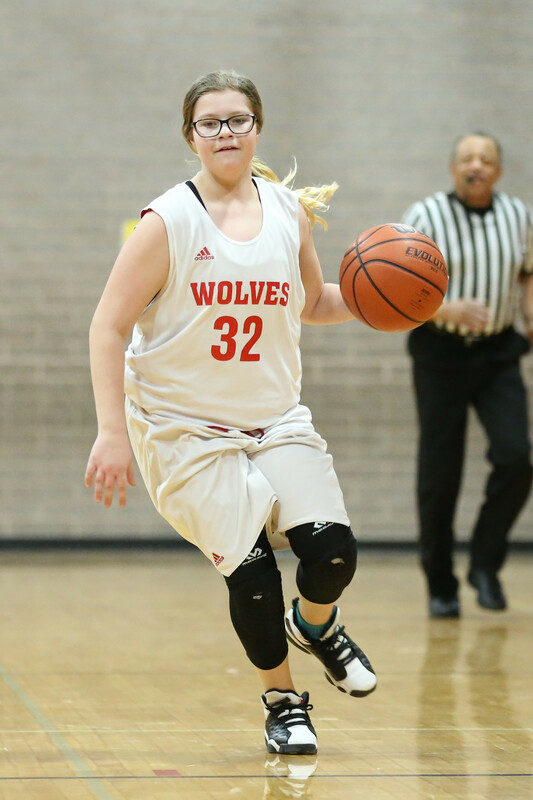 Ryanne Knoblich, a varsity/JV hybrid who was the only CMS player on the floor with non-school playing experience, scored all four of Coupeville’s points, and all on hard-earned free throws. Adrian Burrows, Jessenia Camarena, Claire Mayne, Cristina McGrath, Melanie Navarro, Abigail Ramirez, Jessica Ross-McMahon, and Jordyn Rogers played with guts, and should be hailed for their effort. Camarena and Rogers, in particular, spent much of their time diving and fighting for loose balls, while Burrows yanked down more than her share of rebounds. The opening game of the day was much closer, as Coupeville came within a final shot of forcing overtime in a 21-19 loss. The Wolves got contributions from everyone on the floor, but special attention has to be paid to the one-woman wrecking crew that goes by the name Brionna Blouin. A night after scoring 14 in a season-opening win against Langley, Blouin splashed home all of Coupeville’s points, hitting a trio of three-balls, including a miracle buzzer-beater, before putting on a fourth-quarter show for the ages. Staying on the court for the entire 28 minutes, while also bringing the ball up on virtually every play with her point guard on vacation, she even earned a nod of approval from take-no-guff lead ref Jim Shulock. Behind their on-fire gunner, the Wolves twice came back from double-digit deficits. After falling behind 10-0 to start the game, Blouin netted back-to-back three-balls to end the first quarter and send a surge through the CMS fans. The first trey was your standard-issue pull-up shot fired on the move, and by standard, I mean standard for an NBA guard, maybe, but not for the other 99% of 7th graders out there. Blouin, for a young player, already demonstrates an often uncanny ability to create a few inches between herself and her defender in a split second, then loft a high, arching shot. Not that she needed to create space on the second shot, as King’s defenders were backpedaling as Coupeville raced the clock in a bid to get up court. One eye monitoring the seconds tick away, the other looking to see if the CHS varsity players working the scorekeeper’s table were watching, Blouin got spectacular. Pulling off not one, but two pump fakes, she slid under a King’s player, then calmly flicked the ball skyward. At which point time stopped in the known universe, allowing all gathered to trace the flight of the ball as it rode the rainbow, skipped off the top of the glass, then settled through the net with a happy little sigh. After that King’s started shadowing Blouin with more than one defender, which paid off with a 9-2 surge over the next two quarters. Coupeville’s defense, led by strong work on the boards from Reese Wilkinson and Kayla Arnold, and hustle for loose balls by Allison Nastali and Skylar Parker, kept the Knights from getting red-hot, but a 19-8 deficit looked imposing heading into the fourth quarter. Well, until Blouin went to work. She pulled off a stop-n-pop jumper, slashed in for a layup, netted a sideline jumper, threw down a turnaround jumper in the paint, then nailed her final three-ball from the top of the arc. King’s only answer to Blouin’s 11-point eruption was one single, solitary put-back off of an offensive rebound, but it stung for two reasons. One, it came not on the first rebound, but on what felt like the 437th (reality says it was rebound #5 off the same offensive possession). Secondly, it gave the Knights the two-point advantage they would need to hang on to the win. With King’s relentlessly pressuring Blouin, Coupeville went to Parker for a game-tying shot, and she came very close to making it a reality. Unfortunately, the basket turned unforgiving, letting the ball skid around the rim, before finally spitting it back out. When King’s players went down the “good game, good game” line at the end of this one, they were saying the words with a fair amount of relief in their voices. While Blouin captured a lot of attention, and rightfully so, her teammates worked extremely hard to help her get to where she was going. Erica McGrath pulled down several rebounds and came close to knocking down her own three-ball, while Ava Mitten, Kaitlyn Leavell, and Desi Ramirez buzzed around, creating havoc on defense.